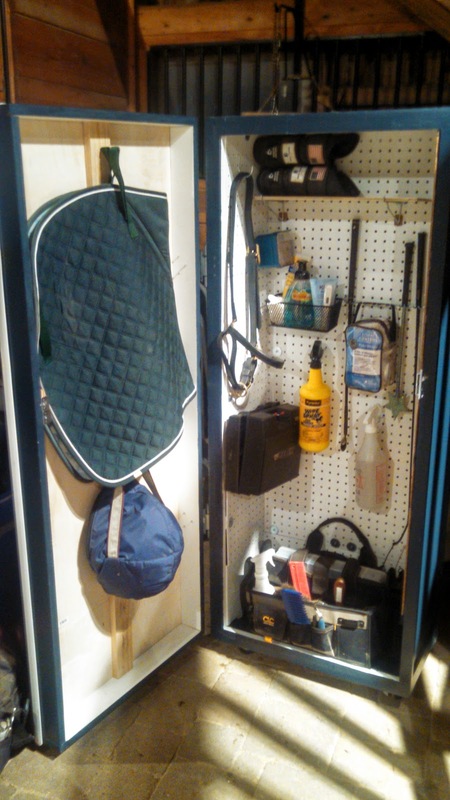 Cob Jockey: Tack Locker: Complete! I am so excited to get to write this post, uh, mumbles 18 months...after starting this project. 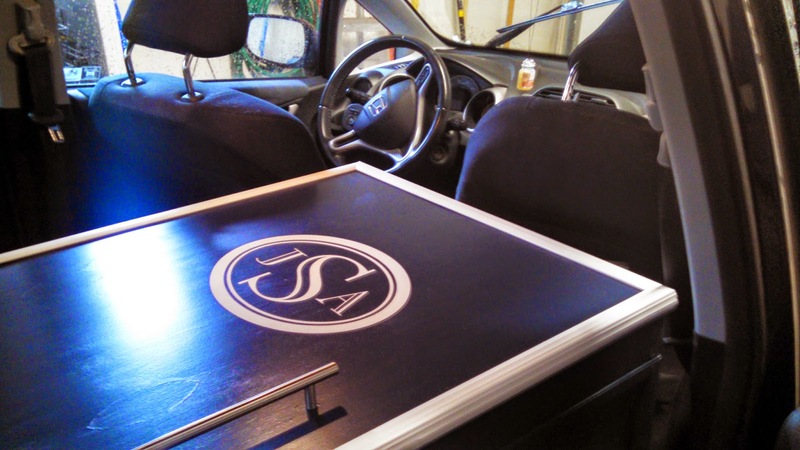 How do people live without hatchbacks? 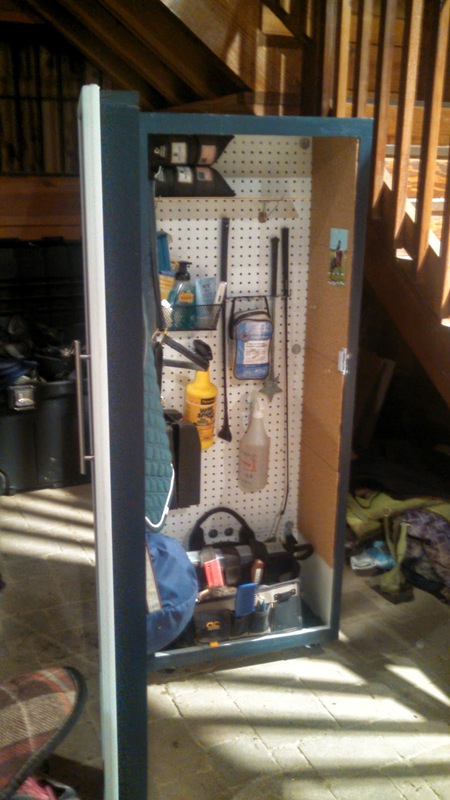 My tack locker went to the barn yesterday! And if it was 2" longer, I would have had to rent a truck to get it there. 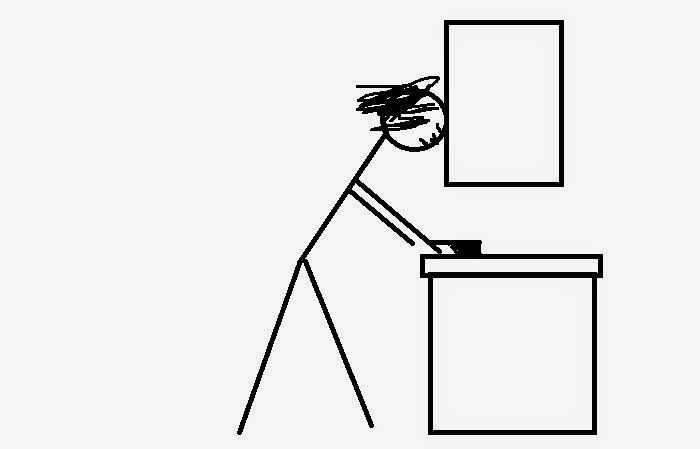 I mean, saws are great. Is there anything more thrilling than using a thing that could kill you to cut apart dead trees (besides riding a thing that could kill you over dead trees, of course)? Using a thing that could kill you to cut apart dead trees. Riding a thing that could kill you over dead trees. I'm so happy with how it came out. Functionally, it's so much better than a trunk, which matters most of all in winter when the last thing you want to do is waste time digging for things you know are in there, somewhere. Most importantly, my trainer is impressed with it and loves having it in the barn (phew). I guess anything is an improvement over my old blue plastic trunk that got chewed on by a foster dog, aesthetically. I'm keeping it around for blanket storage, up in the loft. Takeaways? I learned a lot. Like aspen is the WORST wood ever for cabinetry. It's FUZZY! That's why it was so cheap, and why I could afford it, though. Also, building stuff is time consuming. This is a fun hobby for me, but it's not for everyone. 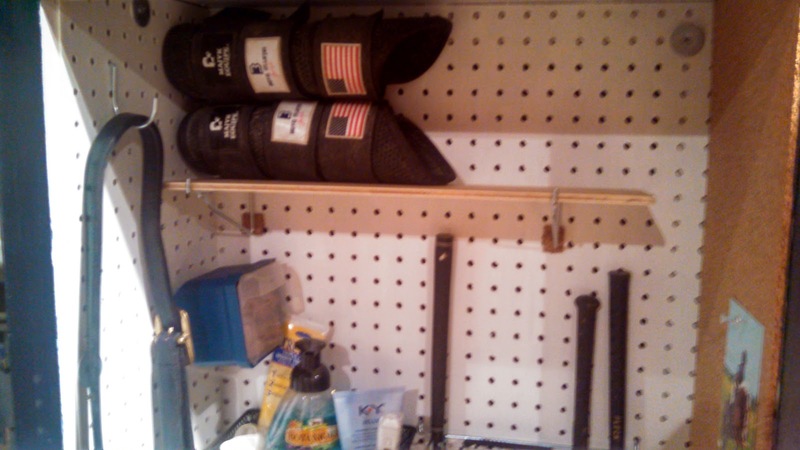 There are pegboard hooks through his hind XC boots to keep them on the shelf. There are things I would do differently and things that are less than professional quality, but hey, it was made with 60% recycled (read: not straight!) wood during a period of extreme financial hardship, and it's my first try at real furniture. It could have been worse! 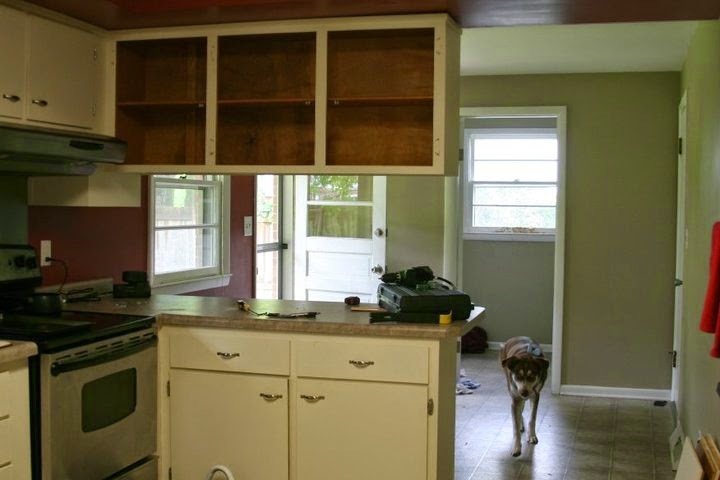 In the upper left is a pull out drawer that holds about a measured cup of treats. Below that is a basket of medical things, and to the right of that is a rack that will hold up to 6 whips. Handle dilemma update: I decided to leave the front handle and I'm glad I did. There's nothing better than having a nice big handle to grab with your gigantic winter gloves. It also doesn't look as much like a fridge after the trim got put on. I am also adding the side handles this weekend - didn't want to put them on til it was in place at the barn. I wish I had taken shop in high school! I am learning as I go after becoming a homeowner and having to do things like replace trim and add door casings. I have a good mentor at work that helps me out, otherwise I would be lost. There is NOTHING more awesome than using power tools to build stuff. You totally need to come to my house - we have all the power tools a girl could ever want! Also, there is not NEARLY enough stuff in there. You need to junk it up a little so it's more legit. No junk! Although I did add some not junk after taking this picture when I hung your bonnets from pushpins on the corkboard. I'm a minimalist, this is everything I need on a daily basis. Everything else goes in deep storage in the loft. I also question how I made it through life without a hatchback, after having one for the last year and a half. The locker looks awesome, nice work! They are the best. 35mpg and I've been able to put everything from antique desks to this to 8 ft lumber in it. LOL in the back of the car it looks like a coffin. So cool though, seems very practical and well designed. And that's creepy because I learned it is exactly my height with the wheels added! Haha. Thanks. Well maybe they can bury you in it eventually. ;) You'll shrink a little with age so it should be a perfect fit. That looks awesome! The peg board is a great idea because you can always change it up later if you want to keep different stuff in there. That's what I'm thinking. 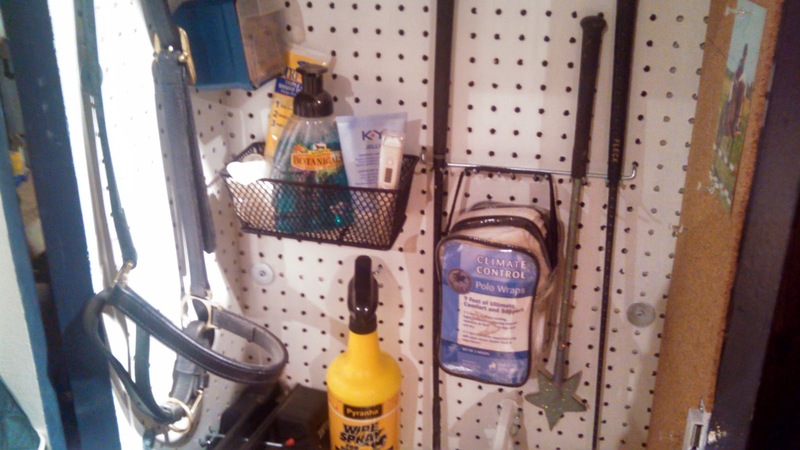 I also learned there are tons of pegboard accessories which are designed for workshops but are great for barn stuff too, like the whip holder. I think it's actually for screwdrivers or something. It looks great and SUPER functional! Oh me too. Trunks are the worst, I did a trunk for one show before I realized it raised my stress level because I couldn't find anything. Now I use that backpack locker, and it's the greatest. 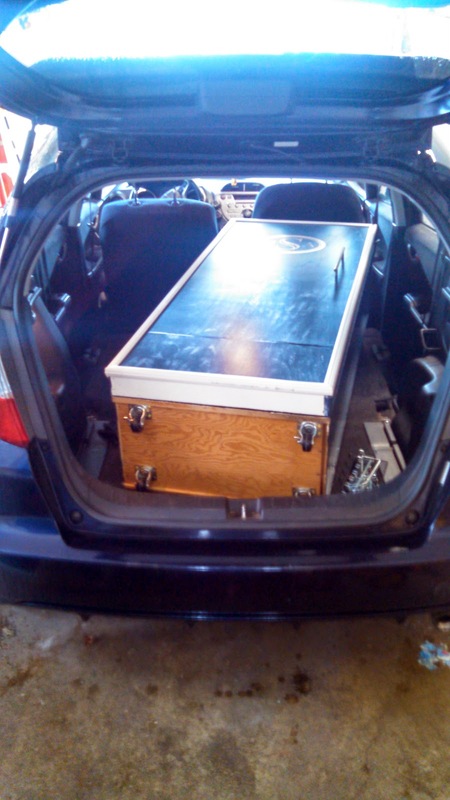 You need a hearse cuz thats a coffin! It's a sparkly BLUE whip thank you very much! ;-) It was a gag gift from Mary in college and I dutifully carried it for every class from sophomore year on. Oh yeah. Another power tool lover. I make G move now and then just so I can renovate ;) Awesome job on the cabinet - love the monogram as well! Yes, your jumps looked fantastic! Looks awesome! I can't wait to see it. Hahahahaha. I did not know you were you! Yay for being super crafty! That trunk looks awesome! It looks really good!!! :) Love it! I don't have them offhand, but I will measure it for you when I (finally) make it out to the barn tomorrow night. It's a standard kitchen cabinet, so whatever that depth is, plus a few inches for the built-out door. Glad you like it! You'll have to share yours when it's done! Thank you! The minute I figured out I'd need a locker vs. a trunk for my new barn, I had to come back and find this post... Thank you for responding even though it's been a while since this post!